Mike and I really enjoyed our trip with you on September 19th. Mike wanted to pass on that out of the three charters he's been on fishing for salmon in the Pulaski area, you are definitely the best and certainly most knowledgeable Captain he has seen. This was my first salmon trip, and I definitely agree with Mike. The proof was in the cooler! Reel Silver was clearly the most successful boat on the water. Everyone else was playing follow-the-leader, and that was you! This is certainly not our last trip to Pulaski by a long shot. 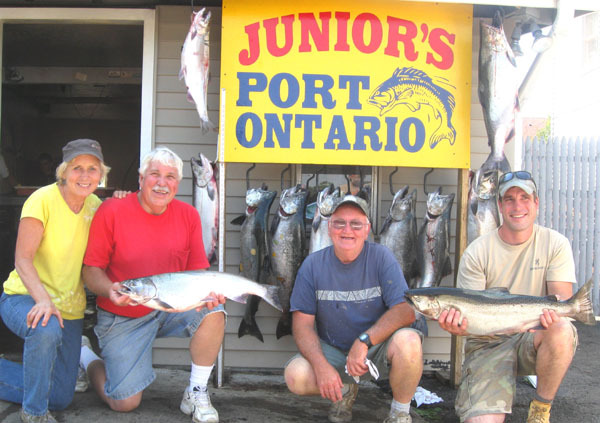 It's good to know that we don't need to look any further than Reel Silver Charters for our Lake Ontario fishing needs! Here's a photo of you with your custom plug. I've included a photo of the salmon Mike caught with it as well. My brother and I planned this trip for a long time, and we weren't disappointed. Thanks again for a thoroughly enjoyable experience! When I graduated college back in 1989 my father and I were supposed to fish for salmon together. It was something I was looking forward to. I was a newly commissioned Naval Officer and the Navy had other plans and I shipped off to flight school the same day as my college graduation to make my class date two days later. Then life happens with wars, deployments, marriages, children and that salmon trip was put off for another 24 years. This September my Father and I planned that long awaited fishing trip. We set up a two day trip out of Pulaski. I flew up to New York from Florida met my dad and two uncles. 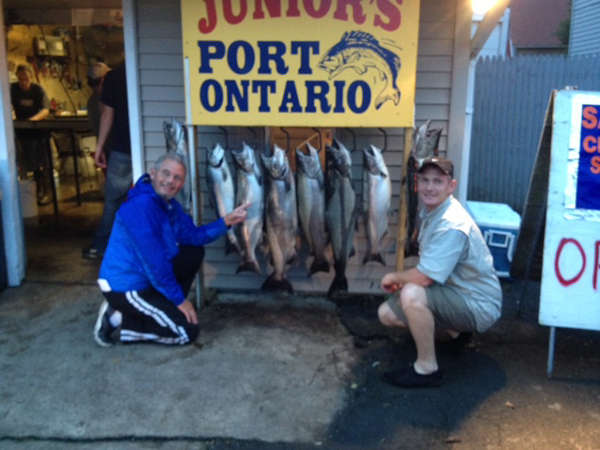 We booked with Captain David and Reel Silver Charters. As a retired Naval Officer I’ve done my share of charter fishing around the world and my experiences have been from world class to almost pathetic. We met Capt. Dave at the boat and first impressions were a very clean boat that was cared for and ready to depart. You sensed he took pride in his boat. The weather was a bit overcast with some showers in the area and the temps were actually quite pleasant. Capt. Dave covered the necessary safety briefing and off we went on our first Lake Ontario Salmon trip. From the time we left the harbor till we pulled back in we were all impressed with his abilities and energy level. He worked really hard to put us on the fish and we hit our limit for both days. He never gave up and if something wasn’t working he would change it up and kept at it till we were doing what we went to do…. Catch some big salmon and make those priceless memories that were put off for far too long. 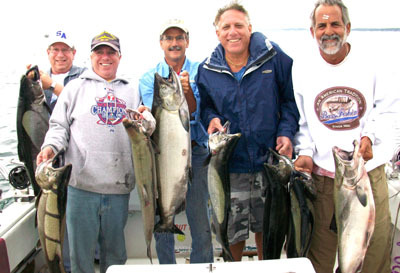 The experience with Reel Silver Charters and Capt. Dave was world class and the trip was truly an amazing time for my father and me to share and we are looking at booking again next year. Thank you Reel Silver Charters. On Aug 24, 2012, my wife, son and brother-in-law had the opportunity to enjoy a perfect fishing trip with Captain Dave Silver. The weather conditions, the knowledge and skill of the captain, combined with hungry king salmon made for an exceptional fishing experience. With expert instructions from Captain Dave, most of our hits became catches. Within a few hours we had our limit! Thank you Dave for your professional and personal interaction with us – we truly enjoyed our trip with you! This was my second year going out with Dave and I'll be returning again next year. He puts you on the fish and keeps working them until they bite. He finds baitfish and changes recipes often so you catch fish. 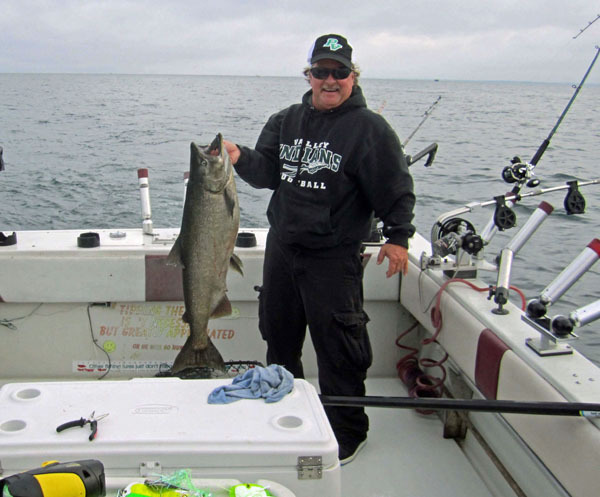 Dave has great knowledge of fishing/boating/people skills and is one hell of a captain. Dave is very reasonably priced and has a comfortable boat. My wife and I took a trip with Dave on our honeymoon and we caught our limit in a short period of time. 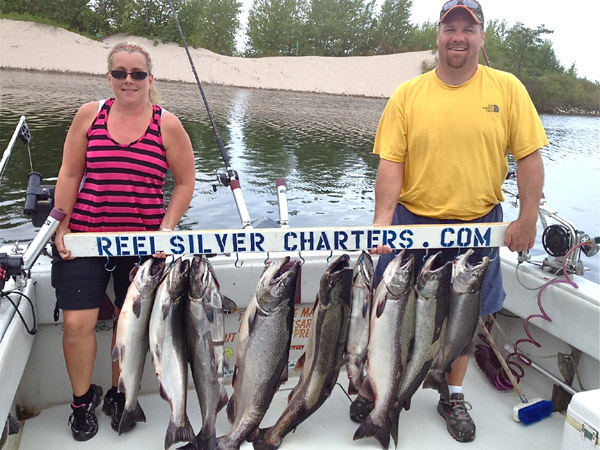 Book a trip with reel silver charters and you won't be disappointed. 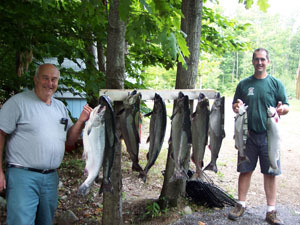 John Ouellette (Madawaska, Maine) drove 10 hours to fish with Dave Silver!!! What a great time! The lake was a bit choppy, but the fish were biting. Everyone onboard caught a nice wall hanger. Three of us caught our legal limits. Dave was courteous and helpful and knew right where to take us. We'll be back! Highly recommended! Above: We've fished with Capt. Dave Silver for 3 years now and have caught tons of fish and had a great time each and every time. Both spring brown trout charter fishing and late summer for salmon. Dave really knows his stuff, a couple times the fishing started out slow and Dave either picked up and ran a few miles to find the fish or changed lures to figure out what the salmon wanted that day. His attitude is always positive and that makes for a plesant day on the water. We fished Lake ontario for the first time last year, 2009, for the spring browns, and wow was that fun. Captain Dave let my kids help set lines and we even caught a fish while letting lures out. We had our limit in no time and capt. Dave suggested we let the small ones go back from now on in case we catch some big ones. Boy was he right, 30 minutes later, I caught a 14lb wall hanger of a football brown, and my son landed a big lake trout. Capt. Dave even knew the best taxidermist. The salmon trip was great too, Dave had to coach my kids on how to pump those big salmon in and they did just what he said, right into the net. That's all my kids talk about now is going fishing with Capt. Dave. They were by far our best fishing trips ever and we can't wait for this year. My friends and I had the fishing experience of our lives. Captain Dave's boat is fully loaded with all the latest in fishing tackle and technology but I've been on other boats with as much equipment and never caught fish as I did with Captain Dave and Mark his first mate. 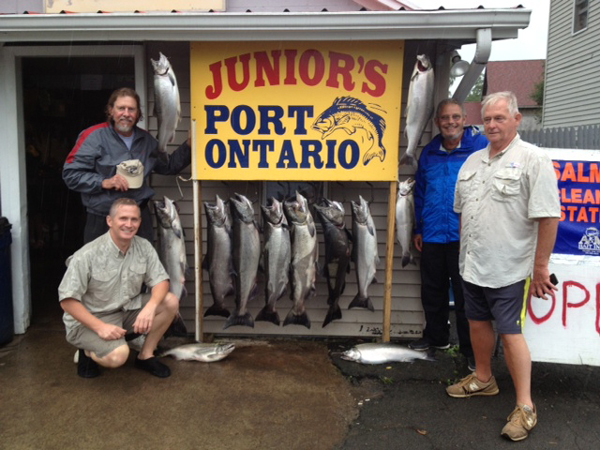 Together they demonstrated a mastery of fishing for Salmon on Lake Ontario that goes beyond just having the right equipment. They really know how to catch fish. We went 14 / 15 in one day with 3 "trophy" sized salmon. My experience with them have hooked me on this kind of fishing and I cannot wait to come back next year and go out with them again. Thanks for the great fishing memories!